The shift that has happened in 40 years which mainly has to do with climate change. Forty years ago, I could say in the Whole Earth Catalog, "we are as gods, we might as well get good at it". Photographs of earth from space had that god-like perspective. What I'm saying now is we are as gods and have to get good at it. Necessity comes from climate change, potentially disastrous for civilization. The planet will be okay, life will be okay. We will lose vast quantities of species, probably lose the rain forests if the climate keeps heating up. So it's a global issue, a global phenomenon. It doesn't happen in just one area. The planetary perspective now is not just aesthetic. It's not just perspective. It's actually a world-sized problem that will take world sized solutions that involves forms of governance we don't have yet. It involves technologies we are just glimpsing. It involves what ecologists call ecosystem engineering. Beavers do it, earthworms do it. They don't usually do it at a planetary scale. We have to do it at a planetary scale. A lot of sentiments and aesthetics of the environmental movement stand in the way of that. I met Stewart Brand in 1965 at the USCO Church in Garnerville, NY, the home of a group of artists and poets who pioneered multimedia art, and who worked closely with Marshall McLuhan, giving joint presentations of a MclLuhan lecture coupled with an USCO performance for college audiences. Brand and I hit it off immediately, partly because at the time had both recently finished our active duty in the military and I recall we both happened to show up that day wearing some semblance of our Army jackets. Thus began a lively conversation that has been continuous over the past 44 years. At the time he was wearing a button that said "America Needs Indians". He was with his then-wife Lois, a mathematician, and an American Indian. A year or two later he wore a button that said, "Why Haven't We Seen A Picture of the Whole Earth?" This was remedied in 1969 when Apollo landed on the moon. I remember sitting on the floor in my living room on a sunny afternoon. Sunshine was streaming through the window, the time on the clock on top of the television set was 3:00 pm. The television screen showed a live photograph of the whole earth ... night and day at the same time. It was a powerful moment: the understanding that there was a whole Earth and that it is always night and day at the same time. The images streaming back from the moon allowed us to step back from Earth, to objectify it, and create the mental space where we could begin to think about it and talk about it as an ecological system. This was the beginning of "the environment". Brand's Whole Earth Catalog, published in 1968 was a key element in the beginning of environmentalism. He has been an influential voice in the conversation for forty years, but the world has changed and he is not one to get stuck holding on to ideas that are no longer viable. In fact, in writing about a cultrually iconic figure such as Brand, it's easy to get caught up in the past — the Merry Pranksters, the hippies, The Whole East Catalog, the personal computer, The Well (one of the pioneering online communities, etc.) But that's not where he lives. These days, he's advocating a science-based "whole Earth discipline" to tackle the global problem of climate change. Standing in the way: the Luddite attitudes of the leaders and the rank and file of the very environmentalist movement he helped to create and inspire, who in their opposition to GMO foods, engineering, nuclear power, and the like, he characterizes as being anti-science, and anti-intellectual, with a tendency to place ideology over pragmatism. His message to this crowd: "you're harmful"; it's time for "ecopragmatism". 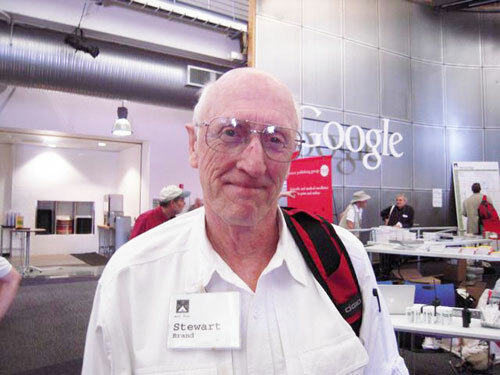 STEWART BRAND is cofounder and co-chairman of The Long Now Foundation. He is the founder of the Whole Earth Catalog, cofounder of The Well, and cofounder of Global Business Network. 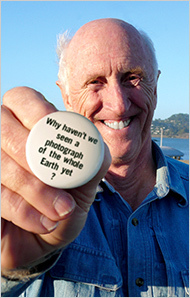 About 40 years ago I wore a button that said, "Why haven't we seen a photograph of the whole Earth yet?" Then we finally saw the pictures. What did it do for us? On the other hand a lot of the experience in the environment movement of doing some things right like being worried about climate very early is part and parcel of what it will take to fix the problem. But it's going to take engineering. But environmentalists don't like engineering. It's going to take a lot more science that environmentalists have to learn to be non-selective about. They like climate science but they are not interested in nuclear science. They like climate science but they are not interested in genetic engineering science. That's what needs to change. But there are a couple of things the environment movement may not change. It feels like it's on a success roll. At least people are believing them about climate and some other things. Everything is supposed to be green. There is a kind of for me a repeat of what happened in the 1970s. We were supposed to care about solar and wind and all these good things, which is great. Environmentalists may not change. In a way it's almost irrelevant whether environmentalists change and take the lead because the political situation suggests that we don't have the global institutions to deal with a global problem. A lot of the best information comes from the United Nations, the United Nations studies on cities and slums and things like this and population are about the best source you can find. If it weren't there, we wouldn't have good information about those things, but it does not have administrative power. We probably don't want a planetary government but I suspect that if we go too far down climate catastrophe that could be something you wind up with, a bad planetary government. What you want is planetary collaboration mainly of the main governments that exist now. This is also a flip for environmentalists and many others, from Ronald Reagan on the right and from Earth Day on the left, governments have been in ill repute. But it's governments that run infrastructure. They run the energy systems. If European nations, North American nations, India and China, all do their governmental job of making coal illegal, make combustion the last source of energy, and adjust their economies accordingly, and they are the ones that can do that, then we might have a shot. They can do it collaboratively. Collaboratively would be much better. They need to take science more seriously than they do. It's one of the reasons China has the potential of taking the lead in this area because all of their leadership has basically an engineering background, whereas our leadership has mostly a legal background. Europe is mixed. India, it remains to be seen. It could go either way. Those nations are the big makers of greenhouse gases. Those are the ones where prosperity is bringing people up the so-called energy ladder to wanting more and more grid electricity. Grid electricity right now is made with coal, which makes greenhouse gases, which is scorching the planet. They should flip to nuclear. We should be doing serious exploration of solar in space rather than on the ground where it tears up the ground because sunlight is so diluted on the surface. We will see what needs to happen over the next few years, and then it's the question of do you believe that these governments and people in general will rise to the occasion. It may take some serious catastrophes before they take it seriously. I suppose the main thing I have changed my mind about 180 is nuclear power. I basically went along with borrowed thinking that nuclear is bad because it involves this long term waste storage problem and therefore we should do other stuff. I didn't think through what the other stuff was, and the other stuff is basically about burning coal in vast quantities and putting vast quantities of greenhouse gases in the atmosphere. By opposing nuclear, I am part of the problem. I came to a realization that the way we think about waste is bonkers. We talk about how it needs to be completely sequestered for 10,000 years. It's as if humans 10,000 years from now will be exactly the way we are. One thing we can be sure of they won't be the way we are now even 100 or 200 years from now. We have learned from Chernobyl that when you have a total disastrous accident with a nuclear reactor the wildlife absolutely love it because it chases the people away and you now have the best wildlife preserve in Europe where we had the worst nuclear accident in history, and that is interesting. This, plus various things, added up to a flip from nuclear is bad to nuclear is good for me. The easy way to think about the change is climate change means turn off coal, that means turn on nuclear. This will have to be sold locally. We will have to deal with the NIMBY ("not in my backyard") problem. For my part, I would be fine with a nuclear plant in my home town of Sausalito. I would be fine with nuclear storage in Sausalito. The place we store nuclear now is in these dry casques out back of the parking lot at the hundreds of reactors in the US and around the world. Waste storage is really not that big an issue. France completely finessed it. If you want to do underground storage there are lots of good places for it. When you look at the details on it and just look at the practicalities that emerged from what is not a very mature industry with great prospects for micro-reactors and things like that, things that look like absolutely show-stopping problems are just mild engineering problems that you solve in an engineering way and go on to deal with more interesting stuff. I have done a considerable amount of public speaking on this subject and talk about nuclear comes in two forms, the short form and the long form. The short form is when I am on a panel and I say nuclear looks pretty good. That will get a boo from an audience and that will get raised hackles from other people on the panel. But people see in my case a whole long cool argument about nuclear, covering all the bases. People have stacked up a bunch of arguments against nuclear. The capital costs, the waste issue, the proliferation of weapons issue. They say, well, when all these things add up you can't do nuclear. When you take them one by one and work through all the arguments — radioactivity is not all that serious, etcetera, etcetera, then people find it actually a comfort in many cases just to shrug and say okay, now that I understand the facts, nuclear doesn't look that bad. So it takes a long form. Unless people want to say, if so-and-so likes nuclear, I like nuclear, which is not a good reason to do it, they need to go through the argument. Another interesting issue that comes up when I talk to audiences is concern about the vast amount of energy that global computation is consuming. To the extent that running the web takes vast quantities of energy to handle all of that cloud computing, we clearly need clean sources of that energy. Maybe some of this stuff should be off planet. Here is a sequence that I see as plausible, just barely plausible. The major expense of working in space in space is the cost of getting into orbit, but we now have the possibility of diverging asteroids that would otherwise crash into earth and cause serious problems. Whatever size asteroid above a few hundred yards, we are looking at at least a 20 percent chance of a very serious asteroid strike in this century. We now have the capability of going out, tagging the asteroids that might be an issue, and then moving them, first by ramming them and then by adjusting their orbit with what is called a gravity tractor. So that is worth doing and it is relatively inexpensive to do. It could be any spacefaring nation, including us, that does this. There are programs that go out and look at asteroids anyway. While we are looking at them, we might as well put transponders on them, see if they are actually a threat, and move them. So far the private companies do not have the scale of, say, the Russian or US or the Indian or Japanese or Chinese space program to do this kind of heavy lifting. But it's imaginable that they could. The great attraction idea is if you can move an asteroid, you can basically mine an asteroid, and metal asteroids are damn near pure gold in an economic sense. They are made of fabulous quantities of extremely valuable metals. In environmental terms mining asteroids is is a low-impact thing to do in the sense that there are no species that you worry about, there are no native tribes that you worry about. You would probably have issues of various nations claiming ownership of an asteroid. But once you start mining asteroids, then the whole economics of being in space flips from "it's very expensive to do science" to "it's actually a commercially valuable venture". Then you start being able to pay for getting stuff off the planet's surface, and a lot of the stuff you might build with in space you get from these asteroids. You don't have to get it up the gravity well. If you do that, then space solar starts to look very plausible and basically you can play out Marshall McLuhan's idea that after Sputnik there is no nature, only art. We would be doing a lot of art in space. Laurence Smith's essay "Will We Decamp for the Northern Rim", which ran onEdge points to some possibilities for new ideas in governance. He had more ground truth than people usually do about that area because it's so remote, about what is really going on with the forests, what is going on with the tundra, going on with the ice and going on with the people and animals that live with the ice. One way or the other, the northern rim is now essential. Because the ice is melting, the northwest passage is opening up. The northern sea route above all of Russia is opening up, and that totally changes the shipping and therefore economic layout of the world. There was a reason that people kept looking for a northwest passage frantically for all those centuries and now we have found it. It's a cruel way to do it. You just melt the ice. That is already a big deal. Humans are going up there for shipping reasons. I may also be welcomed by the people who live in Greenland especially if they can finally grow some crops. If we keep warming and the equator basically move north and south, the equatorial tropics move north or south and it gets drier and hotter, people will move toward the poles. There is not that much land in the Southern Hemisphere. There is a lot of land in the Northern Hemisphere. Siberia, Canada start to look like in some ways prime land. People might want to go there. It's still dark half the year. It has some disadvantages but it's an area that is going to have more people thinking about it, getting oil out of it and looking for uranium in it and all the rest and possibly living there. But the other reason the northern rim is essential is that is where a lot of methane is locked up, in the permafrost in the form of methane clathrates. That if they melt, this is a greenhouse gas 20 times more potent than carbon dioxide. It doesn't stay in the atmosphere as long but it is very potent. It can lead to big sudden jumps in greenhouse gases and in warming and how do you reverse that? So the northern rim is interestingly a global domain but there is only five or six nations that are directly involved in it. So it may actually be a tractable policy world where you can do some things applied to that area, applied just to the permafrost, applied just to the ice, applied maybe just to the stratosphere above the poles. You put sulphur dioxide in the stratosphere, get sulphate, which thins the air and as we found with Pinatubo, the volcano that blew some years back. You put a lot of sulphur dioxide in the atmosphere it cools everything off. You could do that just in the north. Again, there are just a few nations involved. That would be a practical way to see if that kind of human engineering might work. Basically, I think geoengineering is now in the process of gradually but steadily moving from a total taboo to we have to think seriously about it and we have to do serious research and take these ideas away from the scientists and turn them over to engineers and try some stuff. Solar has a lot going for it — I've been using solar for 30 years — solar electric. We used to run electric fences to keep cattle out and open gates automatically. We have a solar water heater that heats the pools. You don't have to use propane. Solar is really good on the individual level, individual building level. On the industry level, the problem is that sunlight is so dilute, and wind has a similar issue, that the footprint of collecting it is huge. There are, I believe, about 80 projects for solar that want to go forward in Southern California that would use 1,000 square miles. Well, that 1,000 square miles is not bare land. It's living desert. It's serious natural landscape that a lot people care about and worked very hard to protect. When you put in solar on an industrial scale, you basically bulldoze the landscape and make it perfectly level. It is an intensely damaging form of technology to the landscape. The same applies to wind. Though it's not as damaging to the surface of the ground, one has to be in an area that has lots of wind and then it just completely covers that area and about the only other thing you can do with it is run cattle. That's okay. But still, vast quantities of land is utilized for not so much energy. Both technologies so far do not have a way to store the energy that they collect when the sun is shining and the wind is blowing. So they don't actually feed into baseload, i. e. , that power that is always on and makes cities possible. The downside of solar, the downside of wind, is gradually becoming apparent to environmentalists and everybody else and we are getting used to the idea of tradeoffs. Because a little more sophistication about tradeoffs is emerging, from doing actual stuff, from actually trying these things. Wind farms have the same cost problems that nuclear reactors do. They are very expensive at the beginning. Sometimes the initial investor can't stay with it. You wind up three investors later and they are gradually making money. That's the norm. I don't think we understand infrastructure. I don't think we understand the economics of infrastructure. We just have big plans. We build stuff and it works out or it doesn't, we pay for it or it doesn't. We're going through a lot of that and we will find that solar and wind are important but not important enough. That's why we are going to need to go further, certainly pushing ahead on efficiency and all that good stuff, but also find some other energy sources that are not combustion and that are not so land intensive as solar and wind. Because biotechnology is probably moving as fast and as consequentially as any technology we have now, if you have an energy problem, one of the first things you do is try to sort out if there is a biotech set of solutions, some engineering approach, whether it's microbes or whatever, that will make it productive. We did the first round of biofuels converting food into fuel. That turned out not to work so well, but it was worth trying. Biotech fuel will definitely be a player. It could get to the point where you fulfill George Church's vision of plants that generate pipeline-ready fuels of various quality for exactly what you want. If you want jet fuel, it will come out of the plants like maple syrup. We're a ways from that but probably not as far as we think. It is, I suspect, not possibly the total solution because again it's a form of solar technology. My agenda for America's climate policy? I suppose it would be energy, agriculture, climate and urban policy. Throw in education, what the hell. Cities are green. Push cities both here and in the rest of the world. Nuclear is green. Push nuclear both here and in the world. Genetic engineering for food crops, for medical crops, for all kinds of things is green. Push that here and in the world. Cohere them around the idea that we are going to have a climate policy for this country which is a model for anyone else who wants to do the same with the hope that everybody does the same and we can come out of the century in at least as good shape as we came into it. So far all the major energy producing biotechnologies are based on one form or another of photosynthesis. That involves very dilute sunlight that gets to the earth's surface. There are some that take coal and turn into something more useful. Craig Venter wants to convert coal down in the ground into methane, which is more efficient and less harmful as a gas source than pure coal. That might work. The general understanding is that we have to go ahead and do absolutely everything including things that we are uncertain about because not all of them are going to work out and we need a lot of things to work out. No one thing is going to fix it. But we're a long way from what the people really want which is what is what Bob Metcalfe calls "squanderable clean energy". We would like to have enough energy not to worry about it. I love the term. It is just such a violation of every fond notion we have that we must live frugally and that if you don't live frugally you are not living properly and all of that. Personally I don't think squanderable energy would be a great thing but I love having it out there as a carrot for those who would like such a thing. Clean squanderable energy. Good, build it. Cities are green. Cities are green because they are energy efficient. It doesn't take as much electricity to heat and cool people in the city. They use much less energy moving around. They can take mass transit because you have mass humanity. Therefore, mass humanity makes sense. It doesn't make sense way the hell out in the boondocks. It turns out to be the way people like to live. So all over the world millions of people every month are swarming into cities. They are putting up with slum conditions because it is such an improvement in terms of opportunity over the situation they were at in the country. The world is losing peasant culture permanently and the rise of the West is over because all the growing cities are elsewhere in the world, the global south, as they say. These are the young people of the world, the innovative people of the world, the ones who take cell phones and turn them into cash systems more quickly than we can, with better cell phone signals than we have in the north. We now have over half the world living in cities. In terms of footprint this uses about 2.8 percent of the ice-free land area of the world. Pretty soon you will have 70-80 percent of the world living in cities. By then we might be up to three percent of the land area, which means that all the places that people move out of and they stop burning the wood for firewood and stoves and heating and so on. The woods come back. They stop killing the animals for bush meat. The animals come back. They stop drawing out of the ground and the aquifers come back. All of this happens as a byproduct of moving away from the country and moving into the city. So cities are pretty green. People will be congregated into cities not because anybody told them to, because they wanted to. I saw a version of this, you saw a version of this, in the 1960s when part of the notion of the time was cities were bad, country was good. Everybody goes out to communes in the country and expires of boredom. Bounced back to the cities and started all these businesses and that's our generation. We loved the country and got over it. Another problem we are facing is what I call the harm issue A peculiarity of the environmental movement is it got trapped into association with leftist politics or at least liberal politics, sometimes leftist politics. It's had various bad effects. Mainly it means that a whole lot of conservatives can't accept the idea that climate change is actually happening because to do that would involve them admitting that Al Gore was right about something and they can't stand the thought of doing that. That's the ridiculous situation we have gotten into. But then if you start looking at the benefits and harms done by various environmental programs, just in terms of is this good or bad for the people, capital P people, the masses, the green revolution was good for the masses. It was good for the people. It staved off famine. It staved off war. For some reason environmentalists like to think of the green revolution was sort of a bad thing. They're wrong about that. What happened is, what Norman Borlaug (the father of the green revolution) and others brought to what we now call the developing world was basically Western agricultural practices that involved fertilizers, that involved herbicides and pesticides, that involved better strains of the food crops that he achieved by breeding, which is now achieved by genetic engineering. Massive quantities of food became available in parts of the world that had not had that kind of productivity in their agriculture ever before, and so it changed the world in a good way. To look down on the green revolution as a bad thing strikes me as real contradiction to liberal principles. It gets worse. Because of the superstition about transgenic engineering, i. e. , genetic engineering, moving the gene from one species into another, that somehow this is again something against "nature." It's not. It's the commonest form of how genes get around in nature. But if all you understand is Darwinian agricultural breeding, then you think there is something wrong with it. Europeans decided that genetic engineering, genetically modified organisms in food, was a bad thing, a really, really bad thing and you mustn't do it. It became one of those things like animal rights or abortion, where it's okay to threaten and burn scientists and their research projects in this area because it is so evil, so Frankensteinian, Franken food. This has hurt Africa, which relies on markets in Europe in order to develop cash crops, for reasons I'm still not clear about. Africa is the agriculture area which has the most need of new technology, especially better crops, which you can get faster with genetic engineering than in any other way. But of the African nations, only South Africa, which had enough of their own scientists who know when environmentalists are saying something useful and when they are not, resisted the European line. Most of Africa bought the environmentalists story that genetically engineered crops are somehow poison, are somehow a bad thing. Starvation is a direct result and maybe a delay of 20 or 30 years in the neediest part of the world getting the agriculture they need prevented by environmentalists. That is hard and it is harm to the People, with a capital P. Environmentalists have sinned. All of the environmental organizations that I know of are opposed to genetic engineering and food crops, some quite avidly, especially the international organizations based in Europe. But the American organizations are also at best mildly anti. Nobody is really neutral that I know of and nobody, and they should be, are strongly in favor. Europeans decided that genetic engineering, genetically modified organisms in food, was a bad thing, a really, really bad thing and you mustn't do it. It became one of those things like animal rights or abortion, that it's okay to threaten and burn all scientists and their research projects in this area because it is so evil, so Frankensteinian, Franken food. It's a problem because genetically engineered crops, just the ones we have, have turned out to be economically beneficial but also ecologically beneficial. They mean higher yield, which means a smaller amount of land needs to be in crops. They mean that if you have the pesticide in the plant itself, you don't need to put it on the landscape. They mean that if you have the herbicide resistance in the crop, like a round-up-ready soybeans, then you don't have to be putting vast quantities of herbicide out there because you can do it right at the point in the crops when the weeds are coming up, kill all the weeds, and you're ahead of the game. So all of this is at least environmentally benign and in many cases beneficial. This is a case where the science is really, really clear and because it goes against some superstitious sentimental notions, the science is ignored. It means that the poor people on the receiving end of insufficient food are left out on purpose by individuals and organizations who have an irrational aversion to genetically engineered food crops. This is a particularly strong attitude among Europeans. At a conference in Germany, Craig Venter was asked "Aren't you playing God?"? His response: "We're not playing". You have to flip it back, come on, guys. We're playing God all the time. What else is new? "We are as gods as we have to get good at it". When Venter was talking to Dawkins, he said, "that's a relief; there is no question about playing God, there is no God". It's true that some of the biotech people now refer to what they are doing as playing nature; i. e. it's biointegrated. It's taking natural processes and conjuring with them. So what else is new? It's just natural processes that are unfamiliar to people, like how microbes make their living. What microbes do all day is what are now doing in the labs. It's not that big a deal if you know what microbes do and it's a huge deal if you don't know what microbes do. One of the peculiarities of this planet's atmosphere is that it's run by microbes and we are only gradually figuring out how that actually works, what role the oceans especially have in it, ocean microbial ecology in chemical transfer and carbon dioxide management and carbon sequestration and all of that. Plus, now that we have gotten down to the nano scale with our technology, with things like metagenomics shotgun, sequencing of whole environments of microbes, we are starting to understand their life and how they run the world. So I guess my solution to the current problems is if you have a question you're not sure what to do about, ask a microbe.